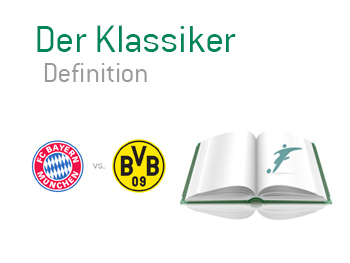 Der Klassiker Definition - What Does Der Klassiker Mean? What is the meaning of Der Klassiker in the world of football? Der Klassiker is the name for any meeting between the two German football powerhouses, Bayern Munich and Borussia Dortmund. It is the most anticipated and most watched club football event in Germany. Similarly to the El Clasico in Spain (meeting between Real Madrid and Barcelona) and Le Classique in France (PSG vs. Marseille), Der Klassiker in English has the meaning of 'The Classic'. Bayern Munich and Borussia Dortmund are dominating German football in recent years. In the last six German Bundesliga seasons (since 2008/09), it was either Bayern or Borussia that won the title. The most famous Der Klassiker was the 2012/13 UEFA Champions League final, held at Wembley Stadium in London, when Bayern beat Borussia 2-1 to win the famous trophy. Bayern, led by Manuel Neuer, Franck Ribery and Arjen Robben, won the treble in that season.